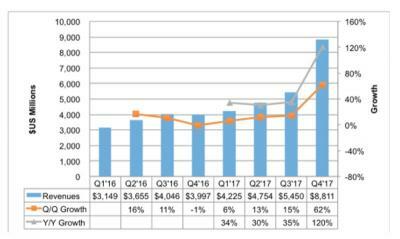 DSCC says that OLED revenues reached $8.8 billion in Q4 2017, growing 62% from the previous quarter and 120% from Q4 2016. The main drivers of this growth are shipments for the iPhone X and OLED TV panel growth in the holiday season. In 2017, OLED revenues reached a record of $23.2 billion, a growth of 57% from 2016 ($14.7 billion). DSCC says that smartphone revenues accounted for 87.4% of the total AMOLED market, and OLED TV shipments had a 5.6% share ($1.3 billion in revenues). The 3rd largest application is smart watch panels (3.2%). While this is impressive growth, it is interesting to note that only two months ago DSCC estimated that Q4 2017 revenues will reach over $10 billion, which means a quite drastic estimation reduction.